Rising up to the challenges associated with corporate responsibility and sustainability is not only a matter of inspired leadership but also demands appropriate staff capable of understanding, managing and fully capitalizing on relative advantages acquired through relevant actions and procedures. For this reason, at Signosis we have developed corporate responsibility training programs that can be tailored to individual needs. 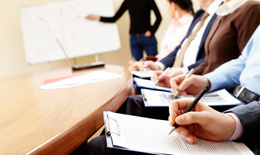 These programs begin with a comprehensive uptake briefing for new hires or the training and introduction on the basic principles and systemic processes entailed in corporate responsibility for existing employees, and continue with seminars on strategy and the management of specific material corporate responsibility issues faced by a particular enterprise. At the same time, we train upper management through the use of workshops to discuss and analyze company-specific material corporate responsibility issues faced within the variety of contexts in which a company may act (such as, for example, commercial development, investment policy, marketing, innovation, management systems, partnership development, and supply chain). In all of our training programs we use customized educational materials and techniques that facilitate trainee participation and the transfer and diffusion of knowledge throughout the corporate environment.